5. R&D, the myth: where is research going to? What is the role of consumer science as a business tool in traditional food sector? 6. How can Consumer Science help to reduce the risk of market failure? 7. What is the role of CS in helping new products development? 8. What are the benefits for a company that employs consumer science in product/process innovation? 9. How CS can be employed in a market growth strategy? 10. How CS can be used for producing info that can be employed in strategy making? 11. How firms can use CS when their products achieve the peak of the product life cycle and they get into the decline phase? 12. How firms can transform their dog (BCG matrix) products into profitable ones by employing CS? 14. How CS can be used for gaining info about consumers and the market? 15. How do firms process info? 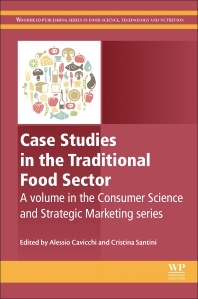 Consumer Science and Strategic Marketing: Case Studies in the Traditional Food Sector aims to close the gap between academic researchers and industry professionals through real world scenarios and field-based research. The book explores how consumer and sensory science has been implemented in the food industry for achieving the following strategic aims: rejuvenating product image, shaping new market places, achieving market differentiation and geographical diffusion, achieving customer loyalty, promoting traditional features of the product and defining product positioning in competitive environment. There is an emerging demand from food industry professionals and undergraduate and postgraduate students who attend business and agricultural studies courses who want to gain practical information through real cases and field-based research. This book aims to answer the following questions, amongst others: How research in the field of consumer science became relevant for marketing strategies?, Which tangible economic and financial outcomes have been obtained by the joint work of sensory scientists, researchers in marketing field and food business professionals?, and which communication methods and practices have been relevant to make the most of R&D in the food industry? Through case studies, successful examples and practices are provided, with newer inputs for further theoretical investigation given. Both current and future professionals in the food industry will gain insights that can be used in their business environment. Cristina Santini is an Assistant Professor at the Università San Raffaele, in Rome. Her teaching experience covers the field of Marketing, Business Management and Strategy. She is the President of the Master Degree course in Human Nutrition for the University San Raffaele. Her research interests include: entrepreneurship, small business, strategic marketing, ecopreneurship and sustainability. Her primary focus is on food and wine business; she is also interested in case study and research methodology based on participatory approaches.